Heat oven to 400°F. In large bowl, mix meatball ingredients. Shape into 30 (1-inch) meatballs. Place in ungreased 13x9-inch pan. Bake uncovered about 15 minutes or until thoroughly cooked and no longer pink in center. In 3-quart saucepan, heat all sauce ingredients exept chives to boiling, stirring occasionally; reduce heat. Stir in meatballs; cover and simmer about 15 minutes or until sauce is hot. Sprinkle with chives. Serve in chafing dish or slow cooker on low heat setting. One can (14.5 oz) Muir Glen® fire roasted diced tomatoes can be used instead of the water in the sauce. 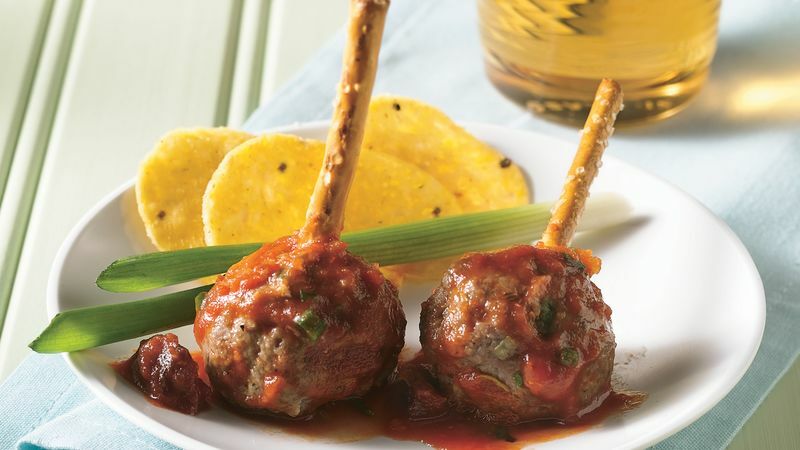 Instead of toothpicks, try spearing these meatballs with pretzel sticks.